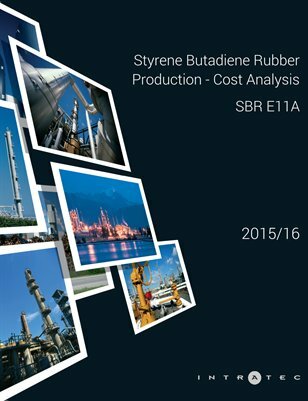 This report presents a cost analysis of Styrene Butadiene Rubber (SBR) production via cold emulsion polymerization process. The process examined is a typical continuous cold emulsion process for producing a non-staining, non-oil extended SBR grade (similar to 1502). In this process, an emulsion comprising water, styrene and butadiene monomers is polymerized into a latex, which is then coagulated to form the styrene-butadiene rubber. This in-depth, independent study provides readers with key and hard-to-find information regarding a production process technology and its economics, such as a description of the manufacturing process and industrial site installations, plant construction cost breakdown, production cost breakdown, and raw materials consumption figures. It was developed according to a consistent methodology refined by Intratec Solutions over more than 12 years, which involves extensive bibliographic research and data gathering/validation, process simulations and robust cost models.